Dental phobia, or a fear of going to the dentist, is not rare by any means. We see nervous patients every day at our practice, and according to research, nearly 75% of the US population feels some kind of anxiety when it comes to visiting the dentist. Dr. James R. Nelson and our team truly empathize with our more nervous patients, and to help them feel safe, calm, and relaxed, we can utilize something called sedation dentistry. With these safe and gentle techniques, we can protect you from discomfort and soothe your anxious thoughts at the same time, ensuring that you have a positive dental experience. If just the thought of going to the dentist is enough to make you tense, then you could probably benefit from oral conscious sedation. With this method, Dr. Nelson will prescribe you medication to take about an hour before your appointment so that by the time you sit in the treatment chair, you’ll be completely physically and mentally relaxed. Most patients say that it makes them feel warm and maybe slightly drowsy and that it helps put their minds at ease. Even though you’ll be sedated, you’ll still be conscious during your entire appointment and able to follow the doctor’s instructions, but you might have little to no memory of it afterward. Oral conscious sedation is strong enough that it is required that a friend or loved one drive you to and from the office the day of your appointment, as well as keep an eye on you for a few hours afterward. Nitrous oxide, better known as “laughing gas,” has been used for nearly 100 years to help slightly nervous dental patients “take the edge off.” This approach is extremely gentle, so much so that we can even use it with children if needed. With this, all a patient has to do is inhale the colorless, odorless gas for about a minute through a small nasal mask. This will create a comforting feeling that envelopes the entire body, and many patients say that it makes them feel like they are slightly floating. You’ll keep the mask on during your entire treatment, and Dr. Nelson can adjust how much gas you receive based on your needs. Once your treatment is over and the mask has been removed, the effects wear off almost instantly, and you’ll be able to go on about your day normally. 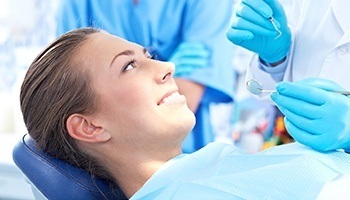 Sedation dentistry has helped thousands of patients finally take care of their teeth in peace and without fear, and it can do the exact same for you. If you have any anxiety about receiving dental care, please let us know, and we’ll discuss which sedation option may be best for you. If you’re ready to have the first stress-free dental appointment of your life, simply contact our office today.